Giulio Terrinoni is a colorfully chef, such as his kitchen at the Acquolina Hostaria in Rome. Bright colors, fulfilling portions and substantial flavors, a show of creative furor, a symptom of enthusiasm without compromises. The Hostaria is out of Rome, in a neighborhood a just off-center. Land for sale between a table and the other, a nice outside garden for the summer, a wine list far from trivial and a Maître able to inoculate curiosities and charm. At least how much the tris of “aperitif” and in particular the aromatic cone with the ricotta, the crispy bonbon with fried capers and the vicious hamburgerino. Because the “welcome” dish it is a “real” dish: noodles with, baccalà (salt cod) and baccalà’s mousse. The almonds will instil a breather. The raw fish is great, even if the service order it’s disorienting: the chill of red onion with oysters is a reinterpretation of the classic vinaigrette, apt, plus with the cold it stuns the papillae. You will resumes with the amberjack with ginger, to welcome the triumphant red shrimp and baby vegetables. Unusual but excellent the red mullet with radish, as well as the fulminating conclusion with the infinite dolphinfish. A real festival of crudismi. The “maccarello” is the cousin of the mackerel: has a supreme burned skin, buttery and compact meat, cooked wisely. The inevitable burrata cheese exalted with an intention of tomatoes. And we are on the brink of the masterpiece. Extremely rich and robust are the cloud of squid’s curls, which come with a soup of chickpeas and bottarga. Dense and chewy, the chunks of squid are wrapped in a kind of compression of flavor under the pressure of insightful chickpeas. To the bottarga is wisely – and rightly – contracted the duty of salinity. The center of the menu is this powerful version of spaghetti Verrigni, by huge caliber, seasoned with a powerful but fresh pesto of Salicornia and seafood. Moreover, the razor clams are suitable for an intensity without bashfulness. Cooking point “romanesco”. 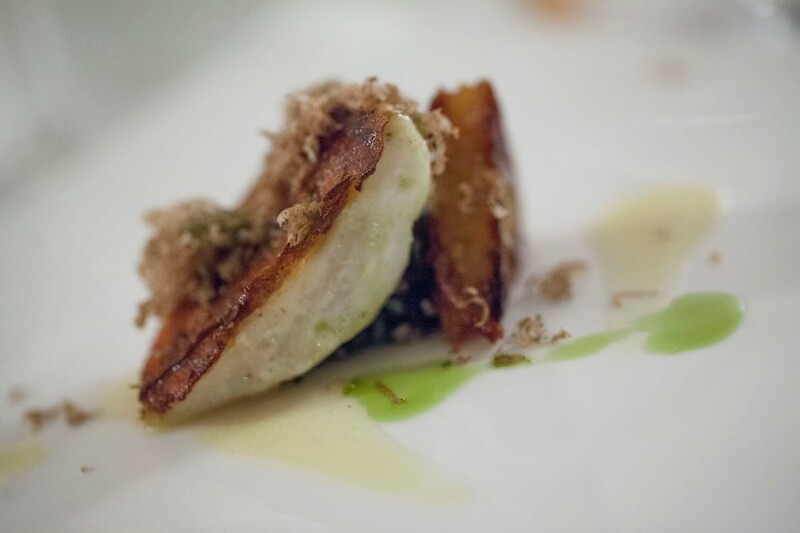 Among the dishes here is the turbot, a beautiful animal in body and soul, with a great crispy skin that is worth tasting, a juicy and lush pulp. The rosti as side dish is a bit ‘woody, but overall the composition works. To close with fresh sweetness: the grattachecca of passion fruit, playful homage to the city, and “cappuccio and cornetto” , a sweet and elastic dough stuffed with a great cream. So there is everything: even the addition is equitable in light of the generosity of the proposal, the shrewdness of the service and the continuity of the quality.